We recommend tackling bathrooms and the kitchen in one day as they’re often two of the most painful types of rooms to declutter. So, tick them off the list first while you have the energy! If you plan on cleaning as well as just tidying, then you’ll probably use some of the same cleaning products on both types of rooms. First, we recommend getting stuck into the pantry. Throw out any old supplies and you don’t use. And, it’s a good idea to organise your pantry supplies into groups (e.g. cooking, baking, cereal, and snacks etc..) so it’s easy to pack them and unpack them when you move. Next, it’s time to get stuck into the cupboards. Take everything out, cupboard-by-cupboard. Make a pile of pots, pans, crockery, and utensils that you haven’t used in at least six months. Repack the ones you use after a wipe-down, stacking them as neatly as possible. Decide later whether you’d like to donate the unused ones or give them away. 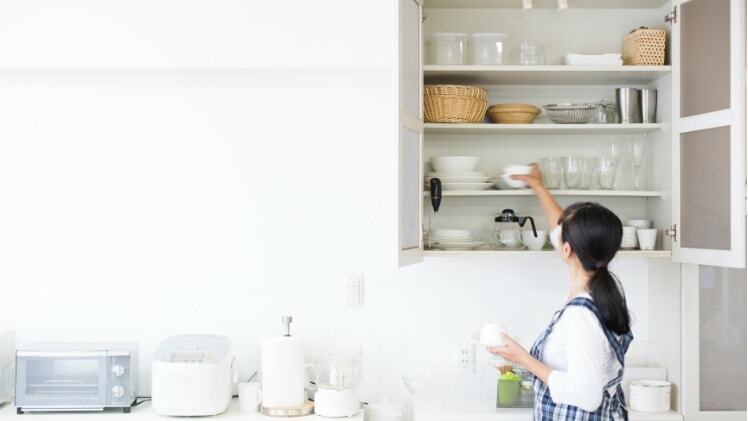 Once you’ve tackled the cupboards, it’s time to clear the bench tops. Now, you may not be someone who keeps a lot on your bench tops… but if you are, it’s time to change that habit! When buyers come through during inspections, maximise the space by leaving it clean and tidy. Next… the fun stuff. It’s deep cleaning time. Start off with the nasty jobs, e.g. cleaning out the oven or scrubbing the stove top and any other appliances. Scrub, spray and wipe the benches and wall tiles, then vacuum or sweep, then mop the floors. What looks good on the bench? A fruit bowl, flowers, salt and pepper shakers perhaps… no more! Voila! You should have a de-cluttered, shiny kitchen. First off, we recommend emptying out all of your cupboards, and sorting through all of your toiletries by putting them into “keep”, “maybe” and “chuck” piles. Wipe out all of your cupboards, and re-pack them with only the “keep” toiletries. Decide later whether to keep the “maybe” pile. Check the rest (and recycle what you can). Give the rest of the bathroom a deep scrub, clean and polish. Try and avoid keeping things on the vanity bench top other than a soap dispenser and perhaps a plant. Only keep the towels on the towel rack that are currently in use, and hang the bathmat up. You’ll find that the kitchen and bathroom tidy has probably taken you a fair few hours. So, you can relax now and save the rest of your energy for day two! You can start day two exactly where you wake up! Your bedroom. The best place to start is your wardrobe, as you’ll feel like you’ve achieved a massive task within a short amount of time. Start, as you did on day one by creating “keep”, “maybe” and “recycle” piles. Be ruthless too. If you haven’t worn something in 6 months to a year, do you really need it? While you’re on a roll, you may as well do all of the bedrooms in the house. Wipe down wardrobes, then re-pack them systematically. Don’t just throw clothes back in. Create piles that you know make sense so you can keep your wardrobe tidy up until you move. If you have a shoe-rack, organise your shoes. In terms of your bed set, if you’re a cushion hoarder, it might be time to let some go if you’re aiming for a decluttered ‘look’. You can then wash all of the linen and while you’re doing so, vacuum the bedrooms. While you wait for all the linen to dry, you can focus on decluttering the rest of the space. For example, bedside tables and shelves. 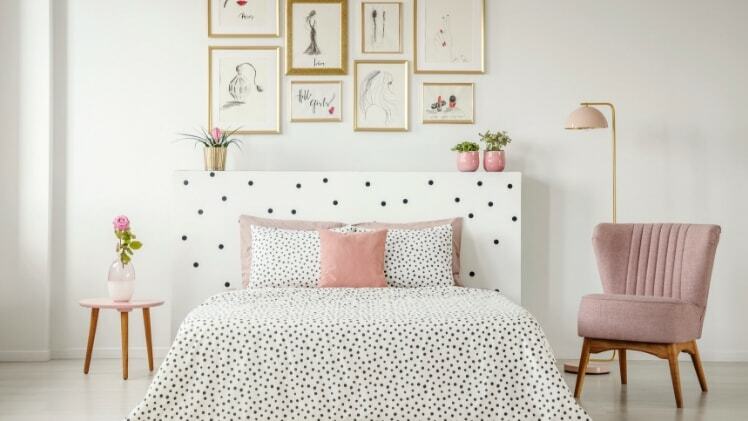 Once that’s all done, you can pop your sheets back on and you’ll have clean and tidy bedrooms! Your lounge room shouldn’t take too long, simply follow the same piling process. Organise any coffee table books neatly and tidy up your TV cabinet and extra storage. If you’ve got lots of cushions on your couches, again, it might be time to let go of some. Place them neatly, fold up any throws and vacuum the room. Now, what’s left? Your “maybe”, “chuck” and “recycle” piles. Revisit your “maybes”. Now that you’ve had a bit more time to think about whether to let go of them, you can either pop them in your “chuck” or “recycle” piles or keep them. At the end of the day, you can take a drive to the second-hand store to donate your goods, and throw out your waste. Exhausting, but DONE! And all very worth it. If you’re pushed for time, you can also hire a home stager to prepare and style your home for sale. But doing it yourself allows you to get organised properly before you move. Previous readingWhat’s the cost of moving house in Australia? Next reading How much does painting a house cost in Australia?